Recognises a single band at 42kD representing beta Actin. The immunogen used for this product shares 77% homology with Gamma actin/actin cytoplasmic 2. Cross-reactivity with this protein has not been confirmed experimentally. 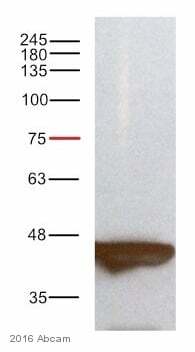 This monoclonal antibody to beta actin works well as a protein loading control in Western blot for a broad range of species including Xenopus, Drosophila and S. pombe. 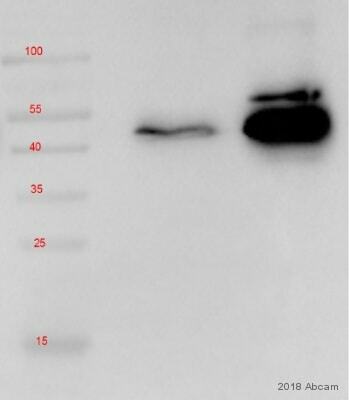 This antibody clone [mAbcam 8224] is manufactured by Abcam. This clone works well as a loading control for Xenopus, Drosophila, S. cerevisiae and S.pombe. We recommend using ab8224 instead of ab8226 for these species. Our Abpromise guarantee covers the use of ab8224 in the following tested applications. WB Use a concentration of 1 µg/ml. Detects a band of approximately 42 kDa (predicted molecular weight: 42 kDa).Can be blocked with Human beta Actin peptide (ab13772). This antibody has been designed for use as a loading control and is ideal for this purpose. Block membrane for 1 hr in 5%BSA. Incubate antibody in TBST for one hour or more. This blot was produced using a 4-12% Bis-tris gel under the MOPS buffer system. The gel was run at 200V for 50 minutes before being transferred onto a Nitrocellulose membrane at 30V for 70 minutes. The membrane was then blocked for an hour using 5% Milk before being incubated with ab8224 overnight at 4°C. Antibody binding was detected using a goat anti-mouse Alexa Fluor 790 (ab175783) at a 1:10,000 dilution for 1hr at room temperature and then imaged using the Licor Odyssey CLx. 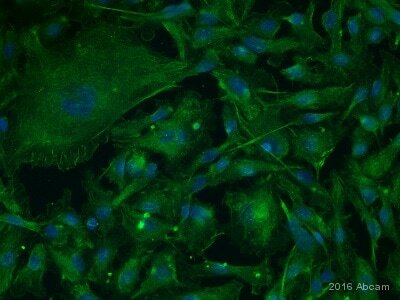 Immunofluorescence analysis of Human Panc-1 cells, staining beta Actin with ab8224. Cells were fixed with formaldehyde and blocked with 1% donkey serum in PBST for 1 hour at 22°C. Samples were incubated with primary antibody (1/75 in 1% donkey serum in PBST) for 1 hour at 22°C. A DyLight®488-conjugated donkey anti-mouse polyclonal IgG (1/200) was used as the secondary antibody. IHC image of ab8224 staining beta Actin in human colon formalin fixed paraffin embedded tissue sections*, performed on a Leica Bond. The section was pre-treated using heat mediated antigen retrieval with sodium citrate buffer (pH6, epitope retrieval solution 1) for 20 mins. The section was then incubated with ab8224, 1μg/ml working concentration, for 15 mins at room temperature and detected using an HRP conjugated compact polymer system. DAB was used as the chromogen. The section was then counterstained with haematoxylin and mounted with DPX. 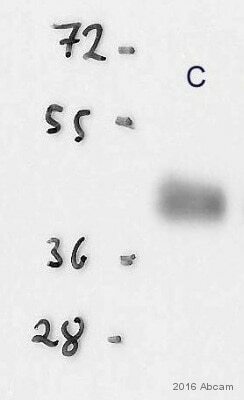 No primary antibody was used in the secondary only control (shown on the inset). Overlay histogram showing HeLa cells stained with ab8224 (red line). The cells were fixed with 80% methanol (5 min) and then permeabilized with 0.1% PBS-Tween for 20 min. The cells were then incubated in 1x PBS / 10% normal goat serum / 0.3M glycine to block non-specific protein-protein interactions followed by the antibody (ab8224, 1µg/1x106 cells) for 30 min at 22ºC. The secondary antibody used was a goat anti-mouse DyLight® 488 (IgG; H+L) (ab96879) at 1/500 dilution for 30 min at 22ºC. Isotype control antibody (black line) was Mouse IgG3 [MG3-35] (ab18394, 1µg/1x106 cells) used under the same conditions. Acquisition of >5,000 events was performed. Immunocytochemistry/ Immunofluorescence - Anti-beta Actin antibody [mAbcam 8224] - Loading Control (ab8224)This image is courtesy of an anonymous abreview. 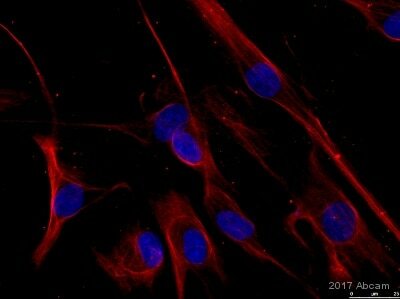 Paraformaldehyde-fixed human fibroblasts cells stained for beta Actin (red) using ab8224 at 1/200 dilution in ICC/IF. IHC image of beta actin staining in human colon formalin fixed paraffin embedded tissue section*. The section was pre-treated using pressure cooker heat mediated antigen retrieval with sodium citrate buffer (pH6) for 30mins. The section was incubated with ab8224, 3µg/ml overnight at +4°C. A goat anti-mouse HRP-conjugated secondary antibody (ab6789, 1/2000 dilution) was used for 1hr at room temperature. The section was counterstained with haematoxylin and mounted with DPX. ab8224 used on Xenopus embryo lysate (20 ug of lysate/lane). Rabbit polyclonal anti-mouse HRP was used as the secondary antibody (ab6728) and developed using the ECL technique. Note: although S. cerevisae is not known to express beta Actin, Abcam believes that the band on lane 3 corresponds to Actin 1 (Swissprot ID: P60010, based on sequence similarity). Blocking step: 5% Milk for 1 hour at 20°C. Immunohistochemistical detection of beta Actin using antibody [mAbcam 8224] - Loading Control on formaldehyde-fixed paraffin-embedded rat cerebellum sections. Antigen retrieval step: heat mediated Citric acid pH6 buffer. Permeabilization: No. Blocking step: 1% BSA for 10 mins @ rt°C. Primary antibody dilution 1/1000 for 2 hours in TBS/BSA/azide. Secondary Antibody: anti Mouse Igs conjugated to biotin (1/200). 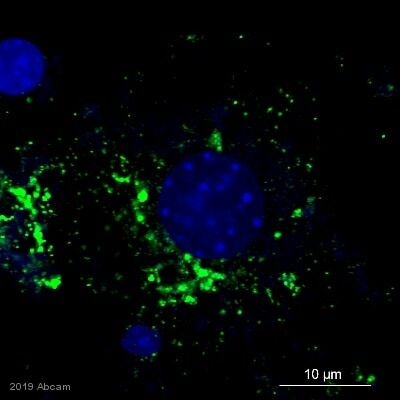 beta Actin appears to be particularly enriched not only in the glomeruli of the Granule cell layer (indicated by red arrowheads ) but also in Microglia (indicated by green arrowheads); All positive microglia appear to be ramified thus not presumed to be activated. Publishing research using ab8224? Please let us know so that we can cite the reference in this datasheet.